Caliber Trades And Exports Pvt. Ltd.
We are indulged in offering Ceremonial Sword to our clients. These swords have brass handle with fittings on scabbard and were used for self protection in early days. 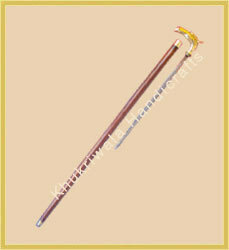 Owing to their high performance, these swords are widely demanded by the clients. We specializes in providing a wide gamut of Police ceremonial swords. These quality-approved cavalry is dedicatedly manufactured by making use of premium quality raw material that are obtained from the authorized vendors of the industry. A team of quality experts examine these products on certain well defined parameters of quality to ensure their flawlessness and defect-free nature.